Harvey Vs. Harvey	An Amount Of Candy The Exact Weight Of The Video Camera Monitoring It. You Cannot Have One. During the creation of the CONTROL pieces, Harvey was often challenged on the ‘truth’ of their projects – a fact that was not lost on the same artists already engaged in the ‘two sides of the same story’ project in Extra-Medium. In resonse, methods were sought to verify the works as authentic. The first project that attempted to provide a form of verification was the TRACKING piece, in which both members of Harvey Loves Harvey traced their daily movements and posted them online. However, even this gesture toward authenticity fell short, and questions were raised as to whether Harvey Loves Harvey could ever actually prove any of the facts stated about the work. This led to many discussions about proof as one of the most important aspects of documentary work, and then questions regarding the nature of proof itself. Perhaps it was possible to prove that the work was valid; yet it seemed more interesting to find if it were possible to prove nothing at all. Thus, the PROOF project was born. Deliberately choosing two simple and familiar methods of proof, Harvey Loves Harvey spent the next two years proving almost nothing. The first method of proof was a Polaroid photograph, taken of the day’s newspaper headline. This is often used to prove that an event happened on or before a certain date, such as damage to an apartment or completion of a manuscript. For Harvey Loves Harvey, it was used to prove both locale and date, as Jason’s headline would be of a New York paper while Matt’s was of a Boston paper. Included in the photo was also the envelope, addressed to the other Harvey, that would be used for the second method of proof. This second method was the unopened, post-marked envelope. This method is often used for legal documents, and the closed envelope with a postmark is offered as proof that a document existed or was signed prior to a certain date. For PROOF, the Polaroid made for the first method of proof was placed in the envelope, along with the headline from the newspaper. The envelope was then mailed to the other Harvey. The recipient would then take this envelope, which he could not open lest he negate the postmark, who would then repeat the process. 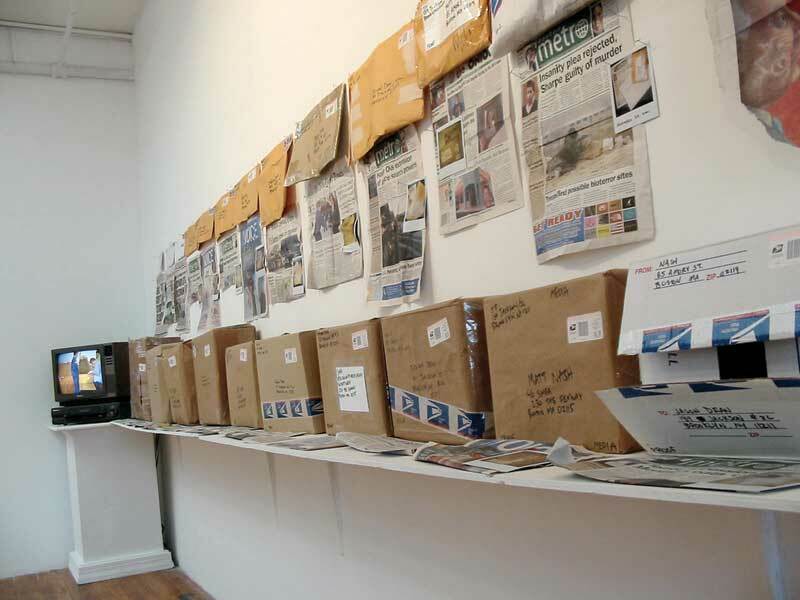 All mailings after the first were photographed with both the postmarked envelope and the newly addressed envelope that would be sent back to the other Harvey. 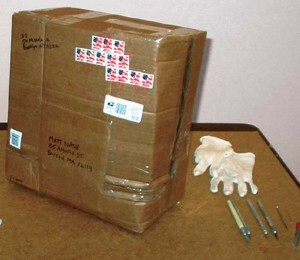 As the project continued, of course, the package grew and grew until it was a box nearly two feet cubed. The final stage of PROOF was opening the package and checking that, indeed, the postmarks and headlines matched. While this would prove nothing other than that the package was mailed on a certain day, it was vital that PROOF be confirmed and verified. For the exhibition One Squared at Oni Gallery in Boston, Harvey Loves Harvey invited long-time Harvey collaborator Colin Tracy to act as an independant third-party verifier. Wearing white cotton gloves and working delicately, the packages were opened and confirmed to be accurate by Mr. Tracy. 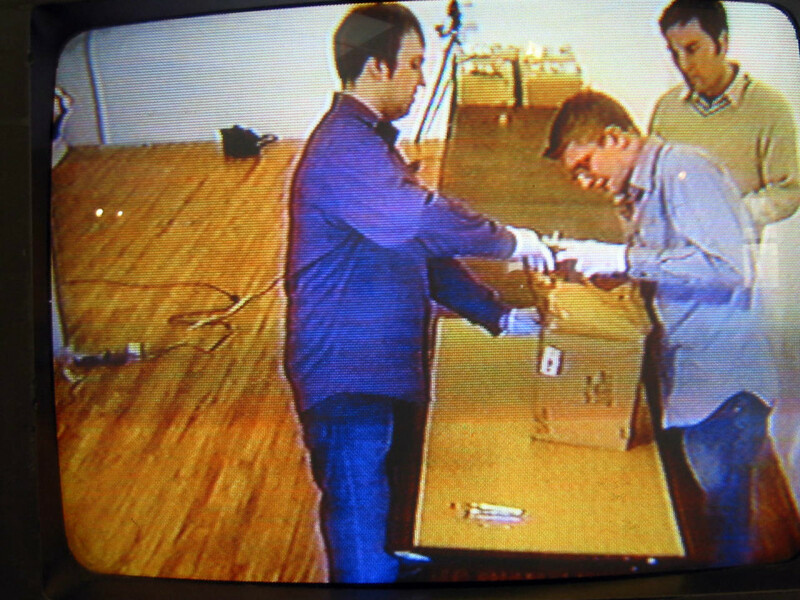 During the verification, artist Andrew Walker used four video cameras to document all proceedings. 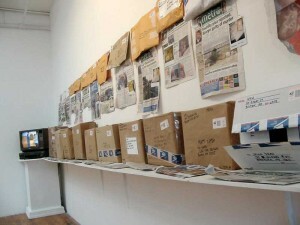 The final piece, PROOF: UNBOXING was presented at Oni Gallery along-side the unboxed and verified packages.